Citation: Ansari AA, Kosov A, Reddy AC, Aeddula NR, Vaikuntam AK, et al. (2018) Renal biopsy during Pregnancy-Permian Basin experience. Jour Ren Med Vol.2 No.2:2. Copyright: © 2018 Ansari AA, et al. This is an open-access article distributed under the terms of the Creative Commons Attribution License, which permits unrestricted use, distribution, and reproduction in any medium, provided the original author and source are credited. Background: Renal disease is extremely rare in pregnancy but presents a clinical dilemma when diagnosed. It is a poor prognostic marker for fetal and maternal health. There is limited data and recommendations to guide therapy in this subset of the population are lacking. We report our experience with 19 pregnant patients undergoing renal biopsies over a period of 5 years. Methods: Retrospective analysis of all pregnant patients undergoing renal biopsy at our facilities from January 1, 2013, to April 30, 2018. Findings: Nephrotic Syndrome (NS) was the most common indication for a renal biopsy during pregnancy accounting for 16/19 patients (84%). Glomerular disorder necessitating an immediate change in management was observed in 6/19 (31%). The median gestation was 32 weeks (range 20-40) with loss of two fetuses. Nondiabetic patients with NS were at a higher risk for preeclampsia (PE) than diabetic patients with NS (p<0.05). Three patients progressed to End-Stage Renal Disease (ESRD) needing dialysis; without any maternal deaths during the follow-up period. Conclusion: Our series of pregnant patients undergoing renal biopsy demonstrates the variety of pathology in this group. An antepartum renal biopsy is safe in early pregnancy but should be considered only if there is a high likelihood to alter conventional therapy and aid progression of pregnancy to fetal viability. Close monitoring and early intervention is a key to improving feto-maternal outcomes particularly in non-diabetic patients with nephrotic syndrome. Renal failure is a potentially life-threatening complication during pregnancy that can affect both maternal and fetal outcome. It may present as a new onset acute renal failure or as a worsening of preexisted chronic kidney disease either known or undiagnosed. Acute renal failure in pregnancy is relatively uncommon and the estimation of incidence might be somehow difficult considering varying diagnostic criteria . Chronic Kidney Disease (CKD) is also a rare pathology during pregnancy and according to population studies might affect up to 0.3% of women in childbearing age . Determining the specific etiology of renal failure by biopsy-proven histopathologic diagnosis would help in early initiation of appropriate therapy in potentially curative glomerular nephritis, or to avoid the harmful unnecessary use of steroids in others . Current guidelines have no consensus on the timing or criteria for selecting patients to perform a safe renal biopsy during pregnancy. Studies in past have suggested no increased risk of complications due to renal biopsy during pregnancy with reported complication rate at 4.5% . However, these recommendations come from a different era, and with the advent of new technologies, ability to precisely identify pathology and therapeutics to specifically target the disease, there needs to be a clear strategy moving forward. There are only a few small clinical studies on renal biopsies during pregnancy that have been published in the past. Though the data is very limited, it does show the clear therapeutic benefit of performing renal biopsies to determine specific etiology of renal failure [5-7]. We performed a retrospective analysis based on our own experience of 19 patients with renal biopsies during pregnancy and compared it to already published data. This represents one of the largest cohort analyses in a relatively short span of time that may reflect an increase in the incidence of renal disease during pregnancy. We conducted a retrospective analysis of data from January 1, 2013, to April 30, 2018, of all pregnant patients who underwent renal biopsies at our institutions. Extensive data from medical records of nephrology, obstetrics and pathology services were analyzed. Patient confidentiality was preserved with all data made anonymous. Indication for biopsy was at the discretion of treating nephrologist. Renal biopsy was performed using realtime ultrasound localization with spring-loaded biopsy guns, and samples were sent for histopathological examination, including microscopy, immunohistochemistry, electron microscopy, and immunofluorescence assays. Patients were closely observed in the hospital settings for post-procedural complications. We identified 19 pregnant patients who underwent renal biopsy, and their clinical data were analyzed. 6 of the 19 (32%) women were primigravida and 13 (68%) were multiparous. Mean age of patients was 26.7 years old (range between 19 and 36 years old), and the mean gestational age 18.7 weeks (range between 12 and 24 weeks). In the majority of the cases, 16 out of 19 patients (84%) the indication for biopsy was a nephrotic syndrome. The most common histopathology was diabetic glomerulosclerosis, 5/19 (26%) followed by lupus nephritis (Figure 1) 4/19 (21%), followed by focal segmental glomerulosclerosis 3/19 (16%). 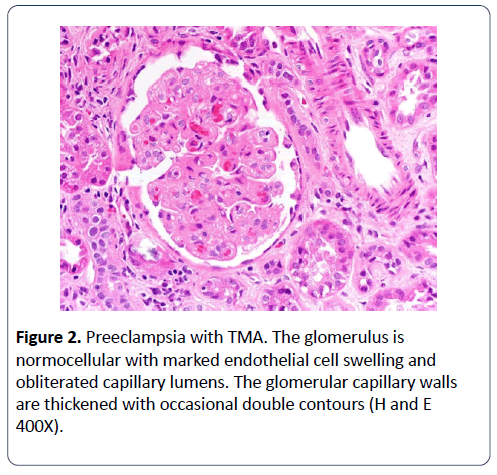 Another pathology found was minimal change disease, IgA and IgM nephropathy, thrombotic microangiopathy, membranous glomerulonephropathy, and preeclampsia changes. (Table 1) shows the detailed characteristic features of this group. 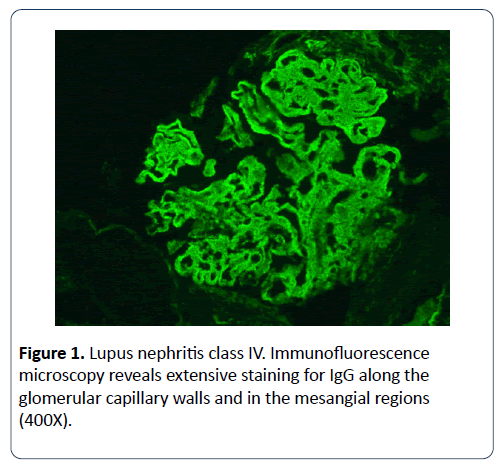 Figure 1: Lupus nephritis class IV. Immunofluorescence microscopy reveals extensive staining for IgG along the glomerular capillary walls and in the mesangial regions (400X). Table 1: Detailed characteristic features of different age groups. The median gestation was 32 weeks (range 20-40) with loss of two foetuses. The fetal loss was not considered to be a complication of renal biopsy. Non-diabetic patients with nephrotic syndrome were at a higher risk for preeclampsia than diabetic patients with nephrotic syndrome (p<0.05). Three patients progressed to end-stage renal failure needing dialysis, and there were no maternal deaths during the follow-up period. All 4 patients with renal biopsy-proven lupus nephritis were started on immunosuppression, and all experienced preeclampsia (Figure 2), but without any other complications during pregnancy. Figure 2: Preeclampsia with TMA. The glomerulus is normocellular with marked endothelial cell swelling and obliterated capillary lumens. The glomerular capillary walls are thickened with occasional double contours (H and E 400X). Despite the rare incidence of renal failure in pregnancy, regardless of stage, whether it is preexisted or undetermined is associated with potentially devastating maternal and fetal outcomes . If not promptly diagnosed and left untreated it could lead to increased rate of perinatal complications and maternal and fetal mortality . There is limited data and recommendations in this subset of the population. There have been only 2 previously published studies that have data similar to ours. Chen et al. reported their retrospective series of 15 pregnant patients undergoing renal biopsy before 30 weeks in 2001. During their 2 years follow up they described eight patients with lupus nephritis, and responses of 11 patients receiving steroids of which 7 achieved remission, with 3 maternal deaths and 2 patients developing the End-Stage Renal Disease (ESRD). They conclude that renal biopsy is not contraindicated and extremely useful. Day et al  published their antepartum and postpartum series of renal biopsy. In their antepartum series of 20 patients, 6 patients developed ESRD, but the higher rate of ESRD was attributed to severe renal disease and possibly a longer follow up with a median of 103 months. However, the intervention and outcome of 7 patients with lupus nephritis are unknown. In our series, 19 pregnant women who underwent renal biopsy were carefully selected by the caring nephrologist based on their clinical presentation and biochemical parameters. Their clinical data is outlined in Table 1. There is variation in pathology when compared to the previous studies with a relatively higher number of patients having diabetic glomerulopathy [5,6]. We do not recommend performing a renal biopsy on patients with nephrotic syndrome with an established history of diabetes unless there is progressive renal impairment or positive autoimmune serology, and a high index of suspicion for alternative pathology. However, undiagnosed diabetes combined with falsely positive lupus serology can often mimic lupus nephritis in presentation leading to a diagnostic challenge. Renal biopsy in such cases would avoid unnecessary exposure to steroids. In our series, renal biopsies were done before 24 weeks, and we recommend doing a renal biopsy if indicated as early in pregnancy as possible. Though other studies have suggested performing a renal biopsy in pregnancy as late as 32 weeks if indicated, after which renal biopsy must be deferred postpartum, as the fetal viability is good and delivery be induced if clinically indicated. Standards of care must be maintained whilst performing a renal biopsy during pregnancy as in non-pregnant patients. Solitary native kidney and small kidneys (<9 cms) biopsy is treated with extreme caution, coagulopathy or thrombocytopenia must be corrected and blood pressure well controlled prior to the procedure. Indications for renal biopsy are an active urinary sediment, nephrotic syndrome, unexplained kidney disease or positive autoimmune serology. In all the previous studies as well as ours, the most common indication for renal biopsy was nephrotic syndrome accounting for more than 70% of the cases. And about 60% of these cases warranted a change in treatment strategy with the initiation of immunosuppression. Multiple etiologies for nephrotic syndrome during pregnancy have been observed. Clinicians treating high-risk pregnancies must be trained to distinguish between nephrotic syndrome due to Preeclampsia, transient proteinuria, diabetic nephrosclerosis, and primary renal disease. Preeclampsia is the new onset of hypertension and proteinuria or end organ damage developing after 20 weeks of gestation. It affects 2%-5% of all pregnancies, and is the most common cause of nephrotic syndrome during pregnancy and resolves after delivery. Preeclampsia can worsen to a severe form, leading to serious maternal and fetal complications, such as cerebral hemorrhage, hepatic rupture, renal failure, pulmonary edema, seizure, bleeding related to thrombocytopenia, abruptio placentae, or fetal growth restriction [10-12]. Renal biopsy can reveal features of preeclampsia but is not needed and the diagnosis must be made clinically . Transient proteinuria is a rare type of nephrotic syndrome observed in pregnant diabetics without any preexistent proteinuria or minimal proteinuria. This phenomenon has not been associated with poorer outcomes and resolves after delivery at term or near term . Renal biopsy is not warranted unless there are other compelling indications in these circumstances. Diagnosis of proteinuria before 20 weeks indicates a preexisting renal disease that may exacerbate during pregnancy, often leading to complications if untreated. Six of our 19 patients were diagnosed with glomerulonephritis, of which 4 had lupus nephritis. Patients were started on immunosuppression according to pathology in a timely manner. Preeclampsia was observed in all but adverse outcome with fetal death and ESRD in mother was observed only in 1 patient. We also observed that non-diabetic patients with nephrotic syndrome were at a higher risk for PE than diabetic patients with nephrotic syndrome (p<0.05) (Figures 3 and 4). Figure 3: Collapsing FSGS. There is global collapsing of glomerular capillary tufts with marked podocyte hypertrophy and hyperplasia. (Jones silver 400X). Figure 4: Diabetic Nephropathy. 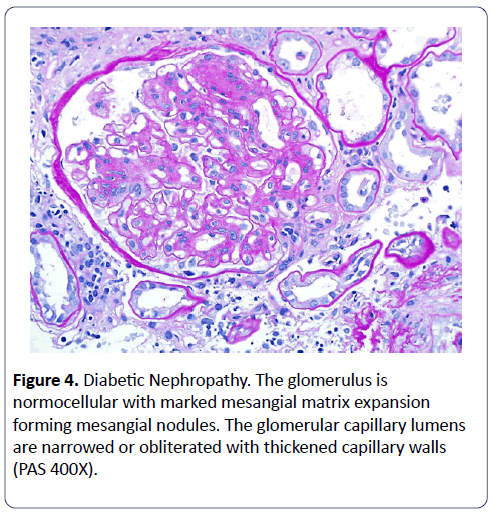 The glomerulus is normocellular with marked mesangial matrix expansion forming mesangial nodules. The glomerular capillary lumens are narrowed or obliterated with thickened capillary walls (PAS 400X). In our series, there were no immediate complications due to renal biopsy performed supporting the previously published materials that renal biopsy in pregnancy is a relatively safe procedure with a very low complications rate [15,16]. There still must be a documented informed discussion regarding the risks and benefit of such a procedure during pregnancy. We conclude that there is a clear benefit of knowing the etiology of renal failure and a timely initiation of appropriate therapy based on pathology will have a favorable impact on the outcome. If indicated, a renal biopsy should be done as early in pregnancy as possible, as the benefit of procedure outweighs the risks of post-procedural complications. Our series of selected pregnant patients undergoing renal biopsy demonstrates the variety of pathology in this group. Antepartum renal biopsy is safe in early pregnancy but should be considered only if there is a high likelihood to alter conventional therapy and aid progression of pregnancy to fetal viability. Close monitoring and early intervention is the key to improving fetomaternal outcomes particularly in non-diabetic patients with nephrotic syndrome. 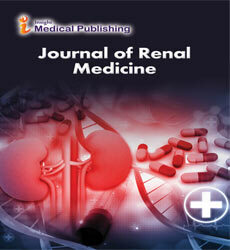 Nwoko R, Plecas D, Garovic VD (2012) Acute kidney injury in the pregnant patient. Clin Nephrol 78: 478-486. Munkhaugen J, Lydersen S, Romundstad PR, Wideroe TE, Vikse BE, et al. (2009) Kidney function and future risk for adverse pregnancy outcomes: a population-based study from HUNT II, Norway. Nephrol Dial Transplant 24: 3744-3750. Balow J ( 1987) Lupus nephritis (NIH conference). Ann Intern Med 106: 79. Packham D1, Fairley KF (1987) Renal biopsy: Indications and complications in pregnancy. Br J Obstet Gynaecol 94: 935-939. Chen HH,Lin HC,Yeh JC,Chen CP (2001) Renal biopsy in pregnancies complicated by undetermined renal disease. Acta Obstet Gynecol Scand 80: 888-893. Day C, Hewins P, Hildebrand S, Sheikh L, Taylor G, et al. (2008) The role of renal biopsy in women with kidney disease identified in pregnancy. Nephrology Dialysis Transplantation 23: 201-206. Fitzpatrick A, Mohammadi F, Jesudason S (2016) Managing pregnancy in chronic kidney disease: improving outcomes for mother and baby. Int J Womens Health 8: 273-285. Fischer MJ, Lehnerz SD, Hebert JR, Parikh CR (2004) Kidney disease is an independent risk factor for adverse fetal and maternal outcomes in pregnancy. Am J Kidney Dis 43: 415-423. American College of Obstetricians and Gynecologists, Task Force on Hypertension in Pregnancy (2013) Hypertension in pregnancy. Report of the American College of Obstetricians and Gynecologists' task force on hypertension in pregnancy. Obstet Gynecol 122: 1122. Biesenbach G, Zazgornik J (1989) Incidence of transient nephrotic syndrome during pregnancy in diabetic women with and without pre-existing microalbuminuria. BrMedj 299: 366-367. GonzÃÂ¡lez-Michaca,Chew-Wong A,Soltero L,Gamba G,Correa-Rotter R (2000) Percutaneous kidney biopsy, analysis of 26 years: complication rate and risk factors; comment. Rev Invest Clin 52: 125-131. Meola M, Barsotti G, Gupisti A, Buoncristiani E, Giovanetti S (1994) Free hand ultrasound guided renal biopsy. Report of 650 consecutive cases. Nephron 67: 425-430.